In the seventeenth issue of the Lounsbury Tree is an article by John Freund entitled "Robert Lounsbury and some of his descendants in western New York." Bill Mac Donald has drawn out this excellent article and placed it in Adobe Acrobat format so that the orignial tables retain their form. Many thanks to our good editor. Some find Adobe Acrobat a very large program for reading pdf files such as the Freund article. Windows computers that find the large program a challenge migh find the smaller (and still free) Primopdf program more palatable. Click for article or download on the blue text. Editor Bill Mac Donald has published Issue 47 of the Lounsbury Tree. It is linked at right. Benjamin Piper Lounsbury was born January 25, 1851 and lived in Wisconsin until moving to the Fontanelle, Iowa area in 1883 where he bought a farm. He married Ellen Lucillia Aspinwall and they had two children, Agnes, and Benjamin Howard. He, (B.P.L) died February 1926. Alice, my mother, was born October 6, 1906 to B.H.L and Edna Woodruff and is still going strong, for 102! 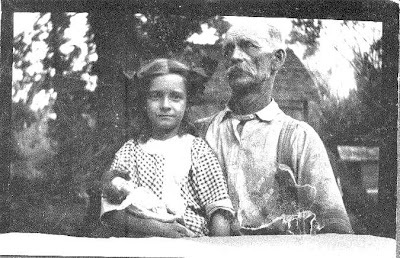 This picture of grandfather and graddaughter was taken in 1917 near Canby, Iowa. It's spring and a new tree has arrived!! Editor Bill Mac Donald has birthed Number 46 of the Lounsbury Tree. It's a strapping one, coming in at 28 pages. It is linked at the right. Enjoy!